Ivan Voukadinov recently visited the Cold War Air Museum and took quite a few pictures. Ivan is from Bulgaria and has kept up with the fate of many of the aircraft that were formerly in BVVS service. He's graciously joined the blog team and agreed to provide some back story on many of the museum's aircraft. Ivan has already researched and emailed us some photos of our aircraft in Bulgarian service. 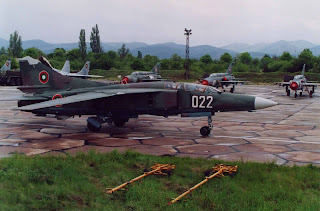 More pictures of the museum's aircraft including pictures of the L-39, Mi-2, Mi-24, and MiG-23 have been posted to the museum's Main web site. We hope also to hear stories from some of the pilots and crewmen of these fine machines during their VVS or Bulgarian Air Force days.